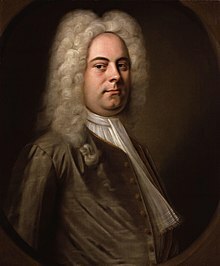 George Frideric Handel (German : Georg Friedrich Händel) (23 February 1685 – 14 April 1759) was a German composer who went to live in England when he was a young man and later became a naturalised Briton. Johann Sebastian Bach and Handel were born in the same year. They were the greatest composers of their time, but they never met. Handel changed his name to George Frideric Handel when he became British; he removed the dots above the "a" and changed the spelling of Georg and Friedrich. The German spelling of his name (Georg Friedrich Händel) is still used by German writers. Handel’s father did not want him to study music; he wanted him to be a lawyer. Although Handel's father died in 1697, Handel enrolled at the University of Halle in 1703. He studied law for a year because his father wanted him to do so. After that year, Handel was unhappy studying law. He decided to stop studying law and become a musician. He became organist at the Protestant Cathedral in Halle. The next year he moved to Hamburg where he got a job as violinist and harpsichordist in the orchestra of the opera-house. Here his first two operas, Almira and Nero, were produced early in 1705. Two other early operas, Daphne and Florindo, were produced at Hamburg in 1708. In 1724 Handel moved into a newly built house in 25 Brook Street, London, which he rented until his death in 1759, 35 years later. The house is now called Handel House Museum and is open to the public. It was here that Handel composed some of his most famous music such as Messiah, Zadok the Priest, and Fireworks Music. In August, 1750, on a journey back from Germany to London, Handel was seriously injured when his carriage overturned. In 1751 he started to lose his eyesight. He died, in 1759, in London. The last concert he went to was his own Messiah. More than 3,000 mourners went to his funeral. He was buried with full state honours in Westminster Abbey. Handel never married, and kept his personal life very private. He left £20,000 which was a lot of money for those days (Approximately 2800000 pounds today) His niece inherited most of his money. He also left some of it to friends, servants, relations and charities. His autographs (the original copies of the music that he wrote) are now mostly in the British Museum. This page was last changed on 7 November 2017, at 04:22.